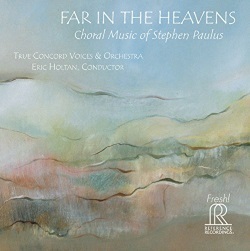 American composer Stephen Paulus died in October 2014, more than a year after suffering a major stroke. His catalogue of compositions features ten operas and a large number of orchestral works, but it is perhaps in the field of choral music that he will be most remembered. His accessible, tonal idiom makes him a favourite with choral singers and audiences alike, especially in the United States. Prayers and Remembrances, the major work in this collection, was commissioned jointly by the performers on this disc and by Mrs Dorothy Vanek. It is dedicated to the memory of Mrs. Vanek's husband, as well as to friends of the couple who lost their lives in the World Trade Centre atrocity of 2001. It was first performed on the tenth anniversary of that event. I cling to the feeling that any attempt to associate a work of art with such an occurrence is almost inevitably doomed to failure. The initial event is so gross as to defy reason, and though words might begin to explain mankind's reaction - anger, sadness, acceptance, resignation - the issue is far too complex to be satisfactorily defined. It is in that spirit that it is important to read and understand the composer's aims in creating this piece. He searched for texts that were "spiritual but not necessarily religious ... that would highlight common beliefs across distinct religious traditions." He wanted to express "hope, light and a future ... the hardest thing to accept in any tragedy". The work is made up of seven choral songs with orchestral accompaniment. A solo soprano contributes to one song, and a solo quartet to the last of the seven. The texts are drawn from sources that include Henry Vaughan, William Blake, a traditional Navajo prayer and the Prophet Mohammed. The theme of loss is frequently present, but subjects such as the beauty of the natural world evoke positive feelings and hope for the future. Another of the composer's concerns, as in all his choral works, was that the words should come through clearly. In this he was very successful, with careful writing for the orchestra and a fair amount of unison singing from the choir. The music is sumptuously conceived and scored, with many moments of striking beauty. Almost without interruption, however, the atmosphere of the work is one of unalloyed sweetness. Sweetness is not, I think, a prerequisite of hope: there are other ways, musical and literary of expressing that. A second aspect that troubles this listener is that in spite of the wide variety of textual sources, the music rather tends to sound the same. Nunc dimittis, sung in English, begins in more austere fashion, with just two voices, but soon reverts to richly scored choral writing, if a little more adventurous harmonically than the major work. A certain mystical atmosphere in the closing doxology is very affecting, though the dissonances in the extended "Amens" seem difficult to justify. The Incomprehensible, a setting of a poem by Isaac Watts, was composed for the performers on this disc. The accompaniment is provided by oboe and harp, and highly effective it is. This is a cheerful piece that nonetheless continues the theme of the collection, in that the poem deals with the mortal aspiration to attain Heaven. I Have Called You By Name is a seven-minute unaccompanied setting of a passage from Isaiah. The booklet refers to the composer's "unique harmonic idiom", rather overstating the case in my view. This is a successful marriage of text and music, though at the very end the composer's sincerity strays perilously close to sentimentality. Little Elegy is a setting of a poem of ten very short lines by Elinor Wylie that deals with the subject of loss. Paulus's setting lasts some three and half minutes, but in that time he delivers the text three times, after which he repeats one more time the poem's first two lines "Withouten you/No rose can grow". There are many lovely sounds in this short work, as there are throughout the collection, but the music does have a kind of "all-purpose" feel, as if one means of expression will do for all. This is partly to do, quite clearly, with the nature of the texts chosen for these pieces, and it is undeniable that when encountered separately they create their own sound-world and satisfy the listener. The final piece, When Music Sounds, is a setting of Walter de la Mare. The poem deals, in the poet's customary sober fashion, with music's power to ... to what? Not, I think, to "soothe and heal" as we read in Peter Rutenberg's adulatory booklet note, but something grander than that, to evoke all that is beautiful and to be celebrated in the world, including ourselves as we "hasten along". Paulus's three-in-a-bar setting is very easy on the ear, but in this case I do feel that he was not up to the job of finding the notes needed to convey these particular words. Listeners who already admire the music of Stephen Paulus, or who react favourably to the great and the not so good in this particular field of choral music - Rutter, Lauridsen, Gjeilo, Clausen, Busto, to name but a very few - will not be disappointed with this collection. Choral conductors will find here several short pieces that will bring pleasure to singers and audiences alike. Listeners at home will probably prefer to dip in and sample one or two pieces at a time, rather than listening to the whole disc in a single sitting. They will be rewarded by outstanding performances from True Concord Voices and Orchestra, a group with many young people in its ranks. Conductor Eric Holtan has just the right feeling for this music, and indeed, it is difficult to imagine these works better performed. The recording is exemplary, and all sung texts are provided.